"The Beautiful American Word, Sure" featured in Verse Daily. If a book can be both innovative and traditional, Suture is. The first line of every sonnet is taken from a previously published sonnet by a well-known poet such as Gerard Manley Hopkins, Rita Dove, Eavan Boland, Pablo Neruda, Wallace Stevens, Adrienne Rich and many others. After that first line, Muench & Rader take turns writing a quatrain or tercet each until the poem is complete. Each poem contains three voices and is a grafting of the old and the new, and in some cases, the living onto the dead--hence the "Frankenstein Sonnets." 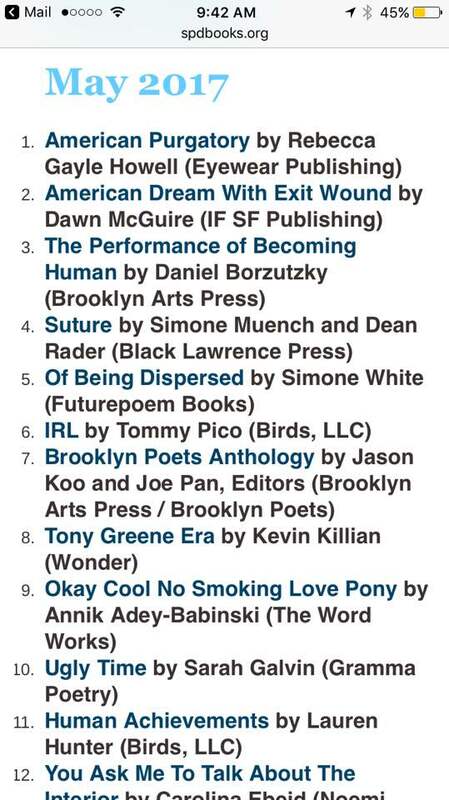 Published in April of 2017, Suture hit #4 on the Small Press Distribution Poetry Bestseller List. Suture is a triumph. Here, two powerful and idiosyncratic poetic forces unite to create something utterly unique: a rare and pulsating lyrical conversation. With vibrating sonnets that shape shift and sounds that knock the sleeping bones awake, these poems allow us to understand we are all stitched to one another through language. sideways at the sonnet, using improvisation, found lines and sheer invention. conventional usage. The result is subversion, disruption and delight. The endurance of the sonnet sequence over the centuries is in no small measure due to a paradox: it is a form that revels both in its fluidity and in its structural exactitude. The sonnet sequence is also apt to engage us because it is typically an expression of solitary yearning, just like the blues. Petrarch longs for his unattainable Laura; Son House laments his dead beloved. In Suture, Simone Muench and Dean Rader turn this latter convention of the sonnet sequence on its head, transforming a mode that seems predicated on an essential loneliness into a collaborative effort, one that is rambunctious, wry, companionable, jittery; and, above all, emotionally capacious. Muench and Rader write with an elegant but mysterious synchronicity—like octet and sextet. You can spend too much time, while reading collaborations, trying to figure out who wrote what, or worse—you can't help but see it, through the seams and stitchery. But these poems are smooth as can be. Muench and Rader, collaborating not just together but with the first lines of other poets, have created or found (who cares?) a beautifully singular voice that pushes back gently every time you pause to wonder "How was this made?" Very quickly you stop asking and find yourself halfway through this excellent book. This particular collaboration began in January 2013. Initially, we contemplated several ideas including a correspondence-type of collaboration in which we would trade individual poems; however, we wanted our voices intertwined in a way that would be indistinguishable to the reader: neither a Rader voice or a Muench voice, but a new third-bodied utterance spawned by differing styles. We elected on assembling the poems stanza by stanza, using this more integrative approach in an effort to co-join the presumed chaos of collaboration with the formal constraints of the sonnet. Because collaboration is frequently perceived as chaotic and can often suffer, as the luminary Michael Anania notes, from the “bipolar diffusion or poetic jiu-jitsu contending egos can produce,” we resolved to work within the framework of a highly structured form—specifically, the sonnet. from a sonnet that would become the first line of the new poem, and we’d recreate the monster all over again.